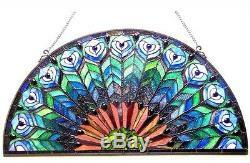 Peacock Design Half Round Stained Glass Window Panel. Decorate your window with this stunning and brilliantly detailed window panel. The beautiful peacock design is perfectly complemented by lovely and bright colors. Hang this piece with easy using the included mounting hardware. 18 inches high x 35 inches wide x 0.25 inches deep. We consider it a top priority that our customers are happy and in the rare event that they are not, we do everything we can to fix the situation. No customer will walk away from our store unhappy. If there's a problem, whether an order arrived damaged, late, or simply because you had a change of heart just let us know and we will work with you to make sure your business with us is to your satisfaction. We guarantee you only the best experience when shopping with us! When returning an item, it must be in all of the original packaging and include all of the original accessories or items that came with it. The item and package should be in original and perfect condition. We do our best to process as quickly as possible. 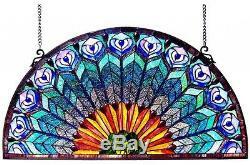 The item "Stained Glass Peacock Window Panel Half Round Circle Hanging Wall Decor Art 35" is in sale since Tuesday, September 12, 2017. This item is in the category "Pottery & Glass\Glass\Art Glass\Stained Glass". The seller is "arvacihomestyle" and is located in Virginia Beach, Virginia. This item can be shipped to United States, Canada, United Kingdom, Denmark, Romania, Slovakia, Bulgaria, Czech republic, Finland, Hungary, Latvia, Lithuania, Malta, Estonia, Australia, Greece, Portugal, Cyprus, Slovenia, Japan, China, Sweden, South Korea, Indonesia, Taiwan, South africa, Thailand, Belgium, France, Hong Kong, Ireland, Netherlands, Poland, Spain, Italy, Germany, Austria, Russian federation, Israel, Mexico, New Zealand, Philippines, Singapore, Switzerland, Norway, Saudi arabia, Ukraine, United arab emirates, Qatar, Kuwait, Bahrain, Croatia, Malaysia, Brazil, Chile, Colombia, Costa rica, Panama, Trinidad and tobago, Guatemala, Honduras, Jamaica, Antigua and barbuda, Aruba, Belize, Dominica, Grenada, Saint kitts and nevis, Saint lucia, Montserrat, Turks and caicos islands, Barbados, Bangladesh, Bermuda, Brunei darussalam, Bolivia, Ecuador, Egypt, French guiana, Guernsey, Gibraltar, Guadeloupe, Iceland, Jersey, Jordan, Cambodia, Cayman islands, Liechtenstein, Sri lanka, Luxembourg, Monaco, Macao, Martinique, Maldives, Nicaragua, Oman, Peru, Pakistan, Paraguay, Reunion.